No definitive date for this exists but it is generally accepted as the late 19th and early 20th century, when explorers mainly from the US, UK, Australia and Nordic countries vied to be the first to reach the poles, carrying out scientific investigations at the same time. It is often more specifically referred to as the heroic age of Antractic exploration. Part of the appeal of this collecting field comes from the incredible stories of hardship and bravery in horrific conditions. And beyond the high-end collectable items such as polar medals it also offers a wide price range, with connections to renowned names such as Shackleton, Scott and Mawson. 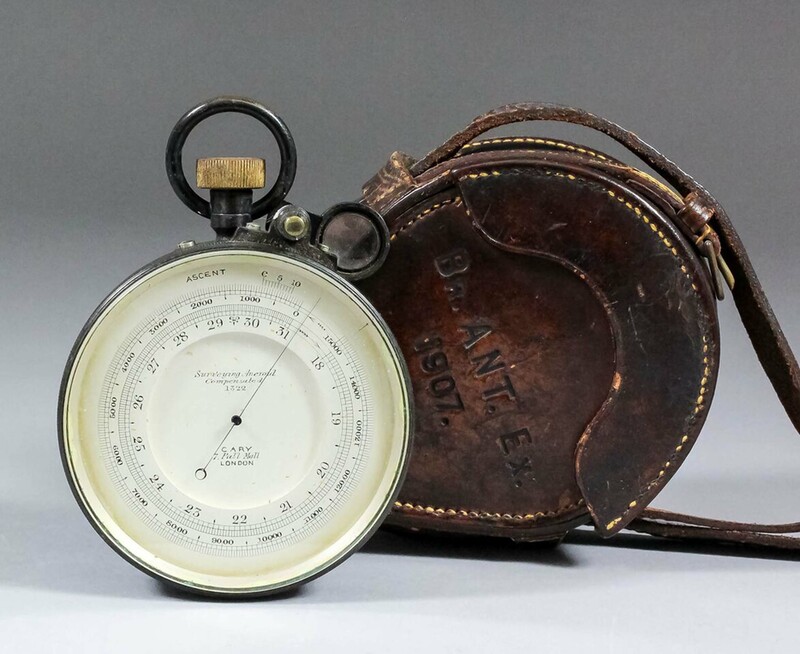 Two items coming up at The Canterbury Auction Galleries on June 5-6 give interesting options depending on depth of pocket/bank account: a pocket barometer used on Ernest Shackleton’s Antarctic expedition of 1907-09 and a dinner plate from the officers’ and scientists’ wardroom of Captain Scott’s Discovery research ship on his first expedition of 1901. The barometer is valued in the five-figure level, at £12,000-15,000. It was carried by Cardiff-born TW Edgeworth David, professor of geology at Sydney University, whom Shackleton invited to join the first of his three expeditions to the Antarctic as chief scientific officer. Their aim was to be the first in the race to the South Pole. They fell short by 112 miles but achieved by far the longest southern polar journey to that date and a record convergence on either pole. Also, Edgeworth David led a separate group of the explorers who became the first to reach the South Magnetic Pole, and achieved the first ascent of the Mount Erebus, Antarctica's only active volcano. By repute, he carried the barometer with him throughout the expedition. The ascent of Erebus, at 12,500ft (3790m) Antactica’s second highest volcano, took five days, summiting on March 11, 1908, the summit party comprising Edgeworth David, his former pupil and a lecturer in mineralogy at the University of Adelaide Douglas Mawson, and Alistair Mackay, a Scottish doctor. Edgeworth David subsequently set up the Australian Mining Corps to attack German trenches in the First World War and was created a Knight Commander of the Order of the British Empire for his service. Mawson, who was knighted in 1914, served as a major in the Ministry of Munitions in the First World War and then returned to teaching, being made an emeritus professor of the University of Adelaide on his retirement in 1952. In a later Canadian expedition, Mackay and three others died of exposure after their ship became stranded, crushed and sunk in Arctic ice. The barometer was supplied by order to Shackleton’s expedition by the company founded by William Cary (1759-1825), of 7 Pall Mall, a noted London maker of scientific instruments, who specialised among other things in navigation and surveying equipment. The 2.75in diameter silvered dial is inscribed Surveying Aneroid Compensated 1322 and has altitude and pressure scales and a blue steel pointer. It is contained in a brass case with scale magnifier and protected from the elements by its original fitted brown leather case, which is stamped BR. ANT. EX. 190. It was retained by Edgeworth David after returning to Australia and then passed on his retirement in 1924 to Prof Leo Cotton, and thereafter to succeeding professors and then by descent. It has been consigned by the family of a medal collector. Detail of the dinner plate from the officers’ and scientists’ wardroom of Captain Scott’s Discovery research ship on his first expedition of 1901, estimated at £800-1200 at Canterbury Auction Galleries on June 5-6. The dinner plate from Captain Scott’s RRS Discovery comes in at a three to four-figure estimate of £800-1200. The Dundee-built ship was one of the last wooden three-masted barque-rigged sailing ships to be built in Britain. According to the Dundee Heritage Trust, a charity dedicated to preserving the city’s heritage, dinner in the ship’s wardroom was the biggest and most formal meal of the day, following strict naval etiquette and sometimes running to several courses. 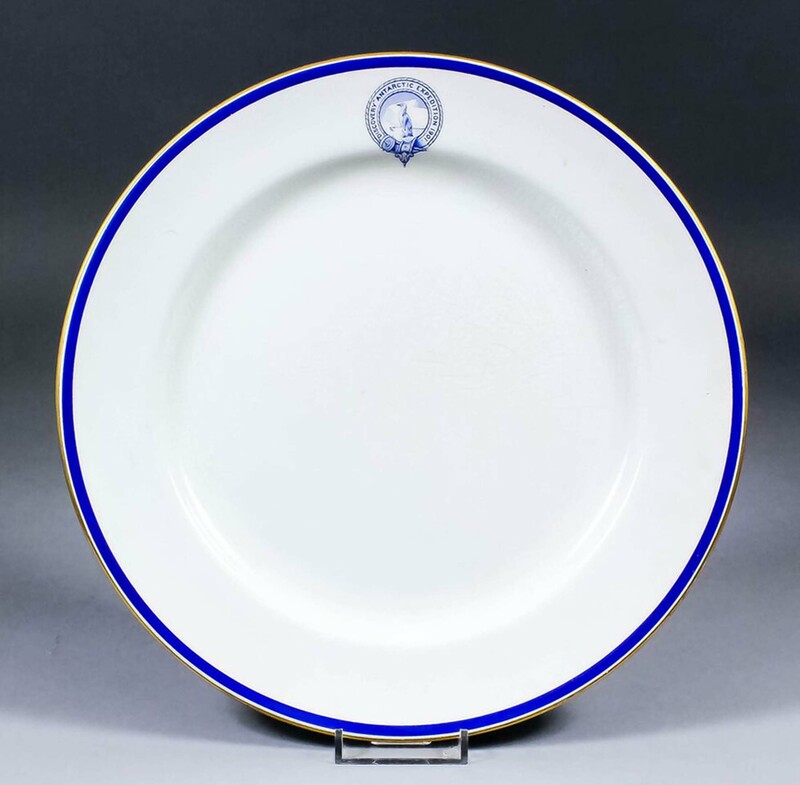 Ofﬁcers and scientists used specially engraved silver cutlery and ate off a dinner service commissioned from Royal Doulton, each gilt-edged piece printed in blue with the symbol of an Emperor penguin on an ice flow surrounded by a rope-edged banner and the words Discovery Antarctic Expedition 1901. The plate is estimated at £800-1200. The choice of a penguin was highly appropriate. Not only was the expedition the first to sight a nesting site and obtain eggs, but the bird also provided much needed fresh meat when rations on the ice consisted of tinned food and biscuits. Robert Falcon Scott’s British National Expedition set sail only a week after Discovery was completed, sighting the Antarctic coastline on January 8, 1902. She anchored in McMurdo Sound and remained there, locked in the ice, for the next two years. She eventually broke free with the use of explosives and returned home, arriving on September 10, 1904 after 1131 days away. Scott was acclaimed as a national hero. Hundreds of new marine animals and creatures had been discovered and miles of coastline surveyed and mapped. He, Shackleton and assistant surgeon, zoologist and artist Edward Wilson and five sledges pulled by 19 dogs travelled to around 530 miles short of the South Pole – further south than anyone before them – but almost perished on the return journey. In the second year, Scott travelled westward and was the first to sight the vast Polar Plateau, subsequently crossed by Shackleton in 1909 in his Nimrod Expedition.